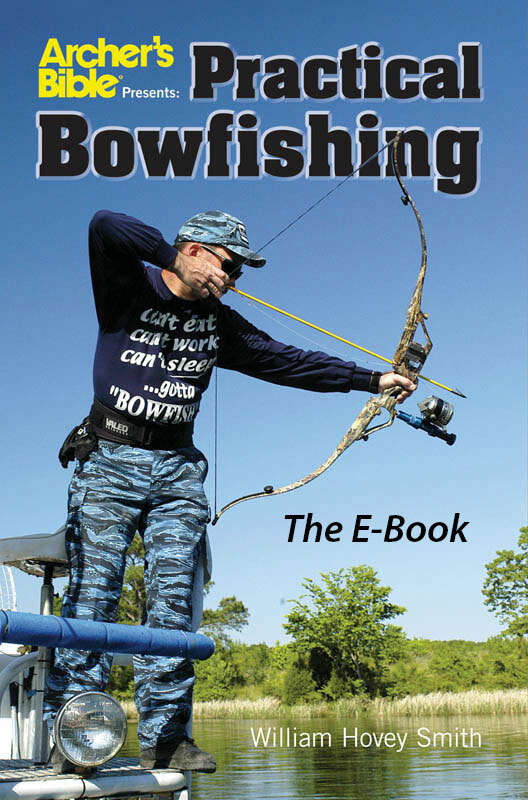 The expanded E-Book version of Practical Bowfishing – Wm Hovey Smith is now available from iBookstore, Amazon.com and as a Nook book from Barnes & Noble. 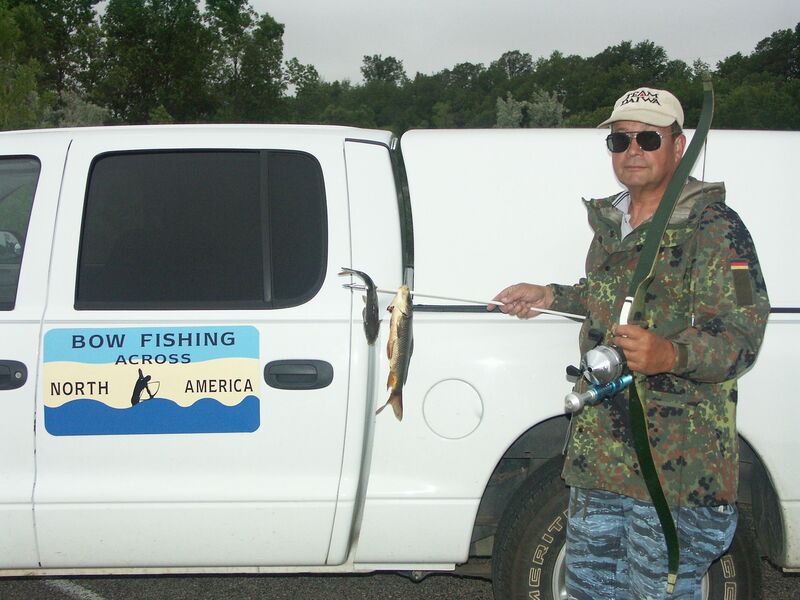 The electronic edition contains a new chapter, “Bowfishing across North America,” which was written about the author’s cross-country bowfishing in 13 states from Charleston Harbor, South Carolina, to Grays Harbor, Washington after the book was published. This trip was taken to prove one of the book’s claims that bowfishing can be done almost anywhere, anytime there is open water. This trip was taken with a beat-up trailer “Weldo Trailer” and patched up boat “Bondo Boat” that I felt was safe to park along almost any road in the country. In fact, there was only one part of one state, the Idaho Panhandle, where bowfishing was prohibited in this mountainous area’s rushing trout streams. The biggest fish taken was a 58-lb. carp from a lake in Central Washington and the most interesting shot was taking two fish with a single arrow. The new E-book also contains updated supplier and contact information, but preserves the original book’s detailed instructions on gear, bowfishing boats, techniques, species, cleaning and cooking instructions. The photos that were removed to make the E-book publishable are replaced with expanded captions to assist the user. 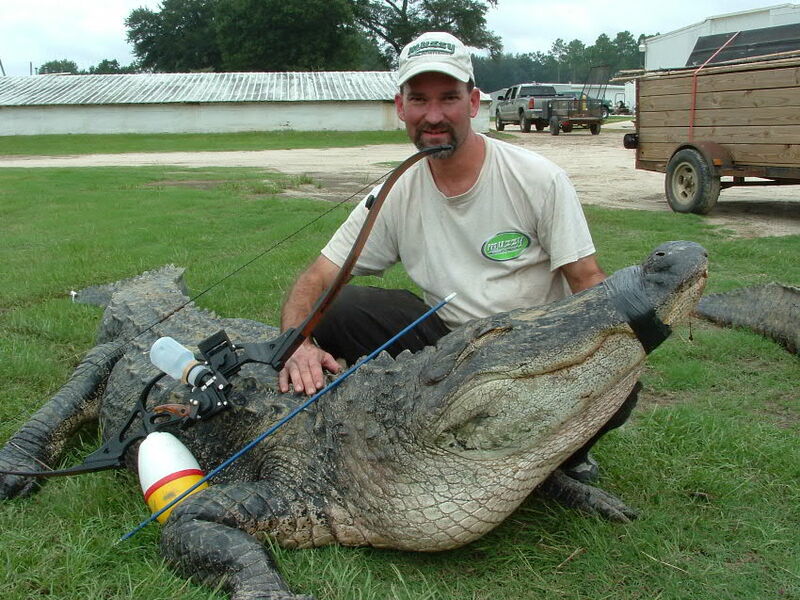 Sometimes bowfishing targets can get quite large, as is illustrated here with Muzzy’s Mark Land and his Georgia alligator. Although used soft-cover editions of this out-of-print title are sold on-line for between $50 to sometimes over $200, new copies of the book from the original printer’s cartons are available from me for a little over $20 at www.hoveysmith.com. The E-book can be purchased now for $8.99 from www.ibookstore.apple.com for Mac-system computers, at www.barnesandnoble.com for Nook readers and from www.amazon.com for the Kindle reader. This book will also be available from Reader Store (Sony), Kobo, Gardners, Baker & Taylor, eBookPie and other E-book outlets by mid-July, 2012.